Ventilation is the process of supplying fresh air air to an enclosed space in order to refresh/remove/replace the existing atmosphere. Ventilation is commonly used to remove contaminants such as fumes, dusts or vapors and provide a healthy and safe working environment; in other words, it is an engineering control. Ventilation can be accomplished by natural means (e.g., opening a window) or mechanical means (e.g., fans or blowers). By itself, the term does not indicate whether the exhausted air is filtered or cleaned before being discharged. Likewise, it does not indicate whether the incoming ("make-up") air is treated is heated, cooled or otherwise treated. Ideally, ventilation provides constant temperature, humidity and air quality within the enclosed space. When ventilation isn't enough, respirators from Safety Emporium may help. Ventilation is a critical concern in many occupational activities that generate dusts, fumes, mists, and vapors. Examples of such activities include welding, grinding, soldering, brazing, sanding, painting, finishing, and the use of volatile and/or flammable chemicals. Keep containers of VOC's tightly closed when not in use. Better yet, utilize a material that does not contain VOC's. Change processes to avoid the formation of mists by, for example, dip coating instead of spray painting. Segregated work areas to minimize the spread of dust. The quantity of hazardous material is small and constant. The air movement is sufficient to keep the concentration of hazardous material at acceptable levels. The materials have low toxicity and flammability. The material will not otherwise adversely affect the surroundings or other workers (corrosion, foul odors, harmful dusts). Do not block or obstruct the air intake or the fresh make-up air source. Perform operations within the fume hood or air intake area. Do not position yourself between the contaminant source and the air intake - otherwise you will be exposing yourself to high concentrations of the contaminant. Make sure the ventilation system is operating properly and is not damaged. Ensure that the ventilation system is compatible with the materials you are using - for example, special fume hoods must be used for perchloric acid to prevent the buildup of dangerously explosive deposits in the ductwork! 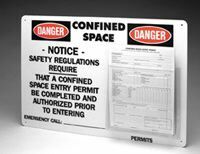 Safety Emporium carries all kinds of safety signs and equipment to make your workplace safer. Local exhaust ventilation is clearly the preferred method whenever feasible! In addition, local exhaust ventilation moves a much smaller quanitity of air much more efficiently - this results in large savings in heating and cooling costs. An enclosure or inlet to collect the contaminated air at the source of its generation (or as close as possible). Ductwork which conveys the contaminated air away from the source. In some cases, a filter or other device to remove the contaminant from the airstream. A fan or other air-moving device to provide the necessary air flow. An exhaust for discharging the cleaned or contaminated air. Fume Hoods - These specialized, fixed cabinets contain and draw in contaminants and vent the contaminated air remotely (usually through a stack on the roof of the building). A good supply of properly conditioned makeup air is required so these systems require professional installation and maintenance. Ventilating Blowers - These have an inlet and outlet hose to collect and move contaminated air away from the source. The model shown here (without the hoses) is portable, making it ideal for use in a garage or workshop. Ventilating blowers generally have the lowest capital cost of the systems shown. 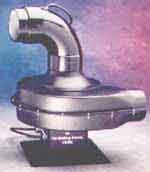 Fume Extractors - These are small air cleaning devices used to filter mists, dusts and fumes. The filtered air is recycled - making it good for many common dusts. Because the air is recycled, this is not a suitable choice for toxic or flammable vapors. Filtering Stations - Are fundamentally similar to the fume extractors shown above, but have better mobility. Down Draft Work Stations or Tables - These use a blower to pull air away from the worker through slots or holes in the table top or work surface. Down draft stations can have a filtering/recirculating configuration (like the filtering station above) or the exhaust can be ducted to a remote point (like the ventilating blower above). "Managing Indoor Air Quality, FouFifthrth Ed", Hardcover, 350 pages, 2011. Estimated price $112.65. Info and/or order. "Indoor Air Quality Issues", Hardcover, 160 pages, 2000. Estimated price $92.10. Info and/or order. "Indoor Air Quality Handbook", Hardcover, 1448 pages, 2000. Estimated price $433.00. Info and/or order. "Woodshop Dust Control", Paperback, 208 pages, 2002. Estimated price $16.72. Info and/or order. "Residential Ventilation Handbook: Ventilation to Improve Indoor Air Quality", Paperback, 400 pages, 2009. Estimated price $53.52. Info and/or order. Also remember that flammable materials or combustible dusts can be ignited if your ventilation system is not properly designed and maintained. Indoor Air Quality at the American Lung Association. Ventilation at the US Federal OSHA web site. Ventilation Of Confined Spaces at Michigan State University. More examples of downdraft tables available from Schubert Enviromental Equipment. Indoor Air Pollution at the NIH's MedLine Plus Encyclopedia. Ventilation for Homes at the US EPA. The Business Case For Managing Ventilation Well. Chemical Safety Levels and Ventilation. A systems approach to an institutional laboratory ventilation management plan. Identifying general laboratory ventilation requirements using a control banding strategy. See also: administrative controls, dust, engineering controls, fume, personal protective equipment (PPE), respirator.